This fall promises to be full of talking, playing, wrestling, dancing, singing, observing, and debating about improvisation! 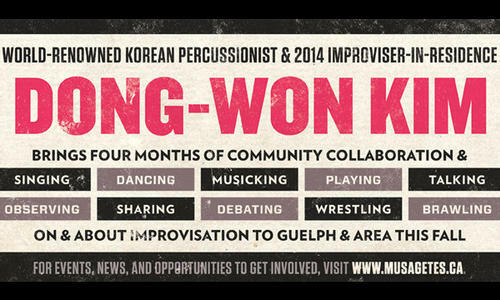 Musagetes and the International Institute for Critical Studies in Improvisation (IICSI), and the Laurier Centre for Music in the Community are excited to host world-renowned Korean percussionist Dong-Won Kim in Guelph as our 2014 Improviser-in-Residence. Over a span of four months, Dong-Won Kim will be bringing together musicians, artists, dancers, writers, designers, illustrators, choirs, bands, orchestras, and classes, through improvisatory music and dance. Weekly drop-in sessions will be ongoing moments for experimenting, learning, sharing, and debating. Dong-Won will also hold workshops with community groups in Guelph and Kitchener-Waterloo. The meetings in the fall will culminate in a collaborative public performance in November 2014. For ongoing news and updates stay tuned to this site! As part of his residency, Dong-Won will hold frequent workshop sessions entitled "Ding-Dong with Don-Won." These sessions are free to attend, and require no previous experience. Participants and audiences of all kinds are welcome. These sessions are held at 46 Essex Street, Guelph, in the Silence space. Please see below for a list of dates and times. Since 1984, Dong-Won Kim has studied various forms of traditional music, such as farmer’s drumming and dance, shaman music, Pansori accompaniment, and music theory from great Korean music masters. By participating in many intercultural projects, he has been devoted to sharing the profound beauty of Korean traditional culture and music with the world. Kim currently teaches music online as a professor of Wonkwang Digital University. He has also written several fairy tales for children and was featured in a music documentary film, Intangible Asset Number 82 (2009). The launch event for Don-Won Kim's residency was held Thursday, August 28th, 2014 from 7-9pm. This event featured an on-stage interview (Dong-Won Kim interviewed by Daniel Fischlin) and a performance featuring Dong-Won Kim, Jeff Cairns, and Jeff Bird. Ding-Dong sessions are free and open to the public, and are held at Silence, 46 Essex Street, Guelph. Participants of all kinds (including audiences!) are invited to join in the fun. No experience necessary.